Made with real fruit. Only naturally occurring sugars, 1 bar = 1 apple. 1 of your 5 a day. Fruit made fun. Great for baking. Perfect for little lunchboxes. Ideal as a snack. Perfect as a gift for your teacher. Gluten free. Tried, tested, approved - family panel. Vegetarian Society approved. 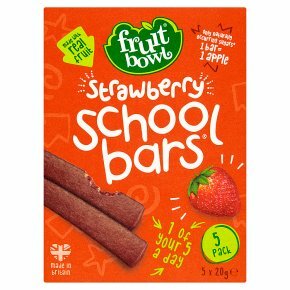 Kosher - Manchester Beth Din.Simple, scrumptious school bars We simply squish fruit with a little fruit juice, and pack into mess-free bars so you can eat them anywhere (not just at school!) - on a skateboard, in a tree, even canoeing with crocodiles!